Perfect for warm-weather boating, the NRS Boater's Gloves deliver maximum blister protection for paddling and rowing and 50+ UPF sun protection for long days on the water. H2Core™ Rashguard material on the back of your hand dries quick, stretches with the flex of your hands and provides UPF 50+ sun protection for your hands. Open-finger design leaves your fingers free for high-dexterity tasks such as tying knots and opening canned beverages. Amara® synthetic leather palms is specifically designed for comfort while paddling or rowing, with extra protection in key wear zones. Sticky polyurethane pads on the palm give excellent grip for paddle control. Synthetic leather panel over the thumb web prevents wear in this vulnerable area. Vent holes in the palm increase cooling. 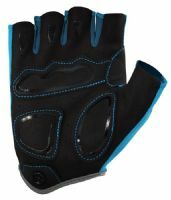 The bike-glove style hook-and-loop closure ensures a secure fit at the wrist.